Greenland Ice Sheet albedo drops 'off the bottom of the chart' – but look closer as to why | Watts Up With That? Got this in the mail just as I posted my open thread announcemnt. I’m too busy this weekend to say much else except to post this tweet from Bill McKibben and some past blog excerpts and invite discussion. CO2 doesn’t change ice albedo, but smoke from the industrialization of Asia does, and I think it is a factor. See why below. It is possibly the same reason for the sea ice decline and the melt pools we’ve been seeing on the surface. Note that this year the melt accelerated quickly once the sun was regularly over the horizon in May…so that an energy dissipation in the ice when soot absorbs solar radiation. Recall this experiment with soot on snow done by meteorologist Michael Smith of WeatherData where soot made a huge difference. These albedo visualizations are discussed here and here. Surface albedo retrievals from the NASA Terra platform MODIS sensor MOD10A1 product beginning 5 March 2000 are available from the National Snow and Ice Data Center (NSIDC) (Hall et al., 2011). The daily MOD10A1 product is chosen instead of the MODIS MOD43 or MCD43 8-day products to increase temporal resolution. Release version 005 data are compiled over Greenland spanning March 2000 to October 2011. Surface albedo is calculated using the first seven visible and near-infrared MODIS bands (Klein and Stroeve, 2002; Klein and Barnett, 2003). The MOD10A1 product contains snow extent, snow albedo, fractional snow cover, and quality assessment data at 500m resolution, gridded in a sinusoidal map projection. The data are interpolated to a 5 km Equal Area Scalable Earth (EASE) grid using the NSIDC regrid utility April and after September, there are few valid data, especially in Northern Greenland because of the extremely low solar incidence angles. The accuracy of retrieving albedo from satellite or ground-based instruments declines as the solar zenith angle (SZA) increases, especially beyond 75 degrees, resulting in many instances of albedo values that exceed the expected maximum clear sky snow albedo of 0.84 measured byKonzelmann and Ohmura (1995). Here, we limit problematic data by focusing on the June–August period when SZA is minimal. As ice accumulates on the ice cap black carbon is embedded in the ice, when a short period of net surface melt occurs the BC accumulates on the surface reducing the albedo and setting up a positive (melting) feedback. Its no surprise this is happening on the Greenland ice cap, because this what has happened to Arctic sea ice over the last couple of decades. New BC deposition may play a role, but its primarily embedded BC that produces this effect. Note in the graph above that the drop in albedo this year starts in May and is clearly a solar insolation effect. I don’t have temperature data for Greenland to hand, but given the more southerly track of the Atlantic low pressure systems this year, Greenland will have had a colder (but sunnier) summer than normal. North America and Europe cleaned up their “soot” and other particulates a few decades ago. This is definitely Asia’s contribution. The idiocy of chasing after CO2 when it is virtually all the other emissions that are the worry. If Asia let the West build their coal-fired plants, this would not be happening and yet, it is the West that is being villified by the (mainly Western) climate CO2 boffiins. I could see Asia’a industrialization increasing Greenland’s ice melt significantly over a period of years. But just from 2011 to 2012!? So, no surprise, what needs to be reduced is real, old-fashioned, Dickensian dark Satanic mill-style pollution in the form of carbon soot & other particulates, not CO2, the new-fangled, supposedly deadly, poisonous pollutant that is actually healthy, naturally-occurring plant food. What’s most telling would seem to be that there DOES seem to be some trend downward in midsummer from year to year (with a few exceptions — e.g. 2006 was on the higher side in June/July). It’s hard to tell from eyeballing the graph though. The soot thing doesn’t seem to make complete sense to me however in terms of what I’m assuming are the elevation numbers (500m to 2,500m) Wouldn’t even fine soot tend to disproportionately settle out at lower altitudes and therefore increased levels of fine soot in the atmosphere have MORE of an effect on albedo and ice-melting at 500-1000 than at 2000-2500? Or am I completely misunderstanding/inverting things? I have NO expertise in climatological stuff beyond the sort of things I’ve picked up from the general news and from the impressive postings here at WUWT. What may be a factor is the huge forest fires in Russia. The west coast of Canada was choking on smoke from over there a few weeks ago. With the way the winds blow up through the Arctic all that soot from the fires could have made it to Greenland. Hmm….. when I see a graph like that I immediately think instrument failure. Or perhaps some sort of interference. It doesn’t make any sense to have albedo 500-1000m but zero at 2000-2500m. If I cared enough I would probably go check that angle, but I don’t. But, before we start pronouncing that soot from Asia just did something this year never done before, someone should check to make sure the needle isn’t stuck. Well, okay curiosity got me. Now I’m even more skeptical of the measurements….. we have albedo at 500-1000m, but none at 2000-2500m, but then magically we have some at 2500-3200m. I don’t know enough about what exactly they are measuring, but that’s bunk. Light doesn’t work that way. It’s just another thing to get hysterical about and a method to ignore the fact that our temps haven’t risen in 15 years. Hm, well, sure would be nice to see a record of Greenland’s Albedo going back about a hundred years, rather than a paltry decade or so. Last time I checked that wasn’t long enough to detect climate trends, right? Why is it, that when we learn a new fact about our world, that we have the hubris to assume we caused it. When the data, points in a different direction. It would be pretty easy to determine if the soot is of human origin. Hmm….. when I see a graph like that I immediately think instrument failure. Or perhaps some sort of interference. It doesn’t make any sense to have albedo 500-1000m but zero at 2000-2500m. Equipment failure was my first thought too, and had started to write a comment about that. Then I figured I should check where the data came from, and found it was MODIS. I figured it would be unlikely to fail just over Greenland, so then I read those other blog pages and saw the comments about a season’s snow melting and that made a lot of sense. Also, it’s not zero at 2000-2500m, the bottom of that graph is 72%, and the 500-1000m graph goes down to 40%. The graphs don’t have a double slash mark to note that. Please gnash your teeth now. I wonder if the way they measure albedo is compatible with what matters. Even though the sun is “up” in the arctic, it’s at a low angle. I see that much of that black bottomed “lake” in the picture is actually in the shade. If many of the lakes are narrow and surrounded by steep sides, they may not look as “black” from the sun’s angle as they do from straight overhead. So we have 12 years of data, and it all, more or less, follows a pattern. Question is: How long has this pattern been going on? The puddle in the icecap has a dark bottom. Is it carbon, or might it be something else. Real scientists go up on the icecap and find out, instead of theorizing. Theories are like belly buttons – Everybody has one. We see black streaks in the sides of the puddle. Is this from petroleum carbon, forest fire carbon, volcanic ash, coal ash, or maybe something that we haven’t thought of? I have news for budding snow experts. Snow, when exposed to sunlight over a period of time, changes from flakes to little balls. In the mountains these little balls promote avalanches. On the Greenland icecap they probably change the albedo. This “study” settles nothing. It does provoke some interesting questions, however. Perhaps most remarkable about the 2012 pattern is how much darker the snow is becoming in the higher elevations net snow accumulation area. June monthly average reflectivity is below the 2000-2011 average across the southern-central area where surface elevations are above 2,000 m (6,561 feet). A purple area about 1/4 the distance north of the ice sheet southern tip at an elevation of 2,400 m (7,874 ft) has reflectivity 0.07 or 7% below the already declining 2000-2011 June (12 year) average. in areas where snow remains, temperature-driven snow metamorphism reduces reflectivity by rounding the sharp ice crystal edges that scatter visible light (Wiscombe and Warren, 1980; Dozier et al., 2009; Warren, 1982). This NOAA climate watch article includes a very useful photo. Fresh snow reflects ~84% of solar energy (Konzelmann and Ohmura, 1995). Increased snow liquid water content in areas of enhanced melting increases absorption of visible light; and potentially less summer snowfall as in year 2011. Summertime snow events take the edge off the amplifying feedback by brightening the surface. With climate warming, the ratio of snowfall to rainfall decreases. It actually does rain on the lower elevations of the ice sheet. I measured 5 cm rainfall in a single 24 h period in June 1998 at Swiss Camp located at 1,150 m elevation along the central western slope of the ice sheet. atmospheric circulation anomalies that deliver heat by advection to southwest Greenland. The pattern of concentrated low reflectivity around the ice sheet periphery indicates the earlier loss of winter snow in the ablation area of the ice sheet where bare ice is exposed each year (Tedesco et al. 2011) sometime during the melt season. That exposure is just happening earlier in the year. The pattern over the far northwestern ice sheet, over the Humboldt glacier is a strong suggestion of increased melting. Cross validation Degrading MODIS instrument sensitivity identified by Wang et al. (2012) introduces the possibility that the declining albedo trends may be erroneous. To validate the MODIS albedo trends, coinciding observations from GC-Net AWS are examined. The ground truth data are situated across a range of elevations, spanning the ablation and accumulation areas. Analysis of the GC-Net data confirm declining albedo trends in the 2000–2010 period to be widespread in individual months from May–September. 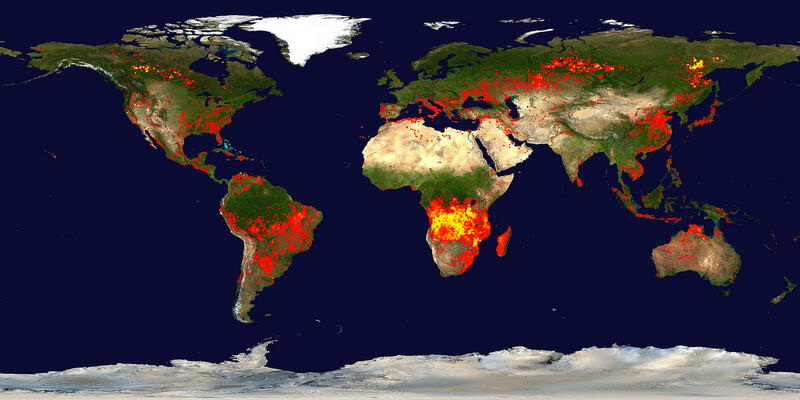 Trend statistics are computed where at least 7 yr of annual data are available from both GC-Net and MODIS Terra. Significance is designated here more strictly where the trend measured by the linear regression slope has a magnitude that exceeds two standard deviations of the residuals from the regression. In 41 of 43 (95 %) of monthly cases May–September, the trend is found to be significant and decreasing. In 10 of 14 (71 %) cases for which both GC-Net and MOD10A1 trends are significant, the GC-Net trend declining trend is larger than the MOD10A1 trend. It therefore does not seem that MODIS sensor degradation is enhancing an existing trend. It seems improbable that degradation of the GC-Net photoelectric diode pyranometers are producing an erroneous declining albedo trend. If both upward and downward facing sensors degrade at the same rate, the albedo would not change in time due to progressive sensor bias. An erroneous declining trend would require that the downward facing pyranometer degrade faster than the upward facing pyranometer. If the degradation is increased by exposure to sunlight as it is with optical black lacquer pyranometers, then the upward pyranometer would be expected degrade faster, introducing an erroneous increasing albedo trend. We observe the opposite. The largest magnitude declining albedo trends are evident at the sites located in the ablation zone such as JAR1 and Swiss Camp. The more southerly yet relatively high elevation sites of Saddle and South Dome where melting is uncommon in passive microwave observations (e.g., Mote, 2007; Tedesco, 2007), declining albedo trends are observed consistently in individual months. Exactly what I thought. It could be due to melt, or soot, or something else, but you better be checking the data when you get an anomaly like that. Somewhere on the intertubes you can find descriptions of the validation experiments for Modis. Ran across it a while back when I was downloading albedo data.. too busy to look for it so, somebody else will have to find it. I admit I can’t measure Greenland’s albedo from my couch with the instruments I’ve got, but I wonder how many of you ladies and gents fly over on a regular basis. I have not been there for about five years, but before then I did fly over Greenland every summer, and I noticed that some of the melt lakes did have dark bottoms, some did not (I attributed that to different depths), and water in them clearly varied in colour (possibly different mineral content; possibly inoculated with different bacteria). I’d say, if there was a significant amount of soot from Asia or any distant place, it would not discriminate between two adjacent melt lakes. My question to the recent travellers: how many of them appear as shown in the picture above this summer? I’ll bet there is orders of magnitude more of that stuff blown over and deposited on the ice cap than there is soot from China. It has always been my contention that soot is the problem with Arctic melting. How can melt take place in a place whose average temperature is below freezing? By insolation. You can SEE the soot. And you can see it in the northwest of North America, especially in wintertime when fohn (chinook) winds cause atmospheric stratification (OK, I don’t know exactly why the atmosphere is stratified, but…). The particulate pollution can be seen as a brown smudge on the horizon with the low winter sun angle. It is certainly incongruous with the wilderness northwest of Canada. I used to see these smudges develop day by day while sitting wells in NE British Columbia for days at a stretch. One looks out the same window for days on end, and cannot help but see the smudge, more congruous with an urban setting, as it drifts across the sky. The only logical source for such a smudge is NE Asia….China’s brown coal plants with no scrubbers or controls. Yup. This hearkens back to the ‘real’ environmental movement of the sixties, which catalyzed the cleanup of particulate pollution in North America and [western] Europe. But, while the world’s attention began to somnambulate into the quack science of CO2 emissions, the developing world and the former Soviet Bloc continued on their merry way, belching particulates. Now the particulates are here and doing their able best to melt the ice up north. What’s worse, there may be an accumulation in multi-year firn on the icecaps, making for a succession of darkened firn layers, which when melted will distribute and concentrate the albedo-crashing blackness. Now to compare carbon soot accumulation with Antarctica…which may so far be escaping the onslaught. Keep weeping, Billy. It will permit the REAL polluters from getting the scrutiny they need. Source Attribution of Black Carbon in Arctic Snow Environ. Sci. Technol. 2009, 43, 4016–4021 attributes most of the black carbon deposited in the Arctic to biomass burning in Russia and North America, however, this is an area of ongoing research. FWIW South and Southeast Asian industrial and biomass burning have pretty damn far to go in order to reach Greenland and almost certainly settle out before reaching there, although they have had an effect on the glaciers on the Tibetan Plateau. North China industrial emissions are hard to tear apart from the Russian ones, and there are indications that they may in part be transported to the area around Barrow..
That should read “reflectivity anomaly 0.07 or 7% below the already declining 2000-2011″. Without the anomaly map and other hints, I read this as reflectivity of 0.07, which is really dark. The average reflectivity of a photographed scene is 0.19 or so, so 0.07 would be remarkably low. I mean, we seem to assuminng that the black is because of something black, rather than just a lack of reflected light of the bottom. I’m with James Sexton at 6:01 pm. Has anyone checked the instruments? That graph looks plain wrong. If it were me I would check three times and get someone else to re-check it again before I published that graph. In Washington State we call that chlamydomonas nivalis. Ours is pink when it’s alive. It is an algae. … I did fly over Greenland every summer, and I noticed that some of the melt lakes did have dark bottoms, some did not (I attributed that to different depths), and water in them clearly varied in colour (possibly different mineral content; possibly inoculated with different bacteria). Hmm. I hope that possibility is checked out. Say, if it turns out to be Asian soot (which could be identified by sophisticated fingerprinting), then WE could start getting line line for reparations! James’s comment that “light doesn’t work that way” is incorrect. I live in the Swiss Alps and climb on snow fields and glaciers frequently. Where you get a dark coloured stone sitting on the snow/ice, the melt around it is clear to see. Everyone knows that dark coloured objects absorb more light and infra-red than light coloured ones, hence water solar collectors are black. Looking at images of icebergs and icebergs calving, you see both darker horizontal bands and scallop shaped dark areas. The former presumably from periods in the past when net surface melt occurred and the latter from BC accumulation in meltwater pools that subsequently got covered in ice. This image shows how much faster the darker bands melt. read the cross validation info I posted. it’s the same sensor for all the charts. And check the page I posted for the albedo at other altitudes. let me suggest before you run off with all your objections and theories that you actually read some of the data and the papers. then when you have an objection or insight it will be more productive. Ric I think you are misreading that. In any case go get the albedo data and have a look. Lol…gnashing done… I should have paid better attention to detail. That’s what I get for not caring and looking anyway! But, I see what you’re saying. Still, this looks odd. And, just because I’m a contrarian, I’ll just throw this out and go back to not caring. With my new found insights on graph reading, we see the percentages for 500-1000m to be ~53%, for 1000-1500m it’s ~55%, for 2000-2500m its ~… well, somewhere under 70%, but 2500-3200 it is ~73%. So far, so good, as one gets closer the impurities are more visible….less albedo. . But, from here is where I’m stuck. The albedo for 500-1000m is within normal limits. It looks like it’s about the same as the last 3 or 4 years…..(I hate spaghetti graphs) Now, again, this isn’t something I’ve pondered on much, so maybe this is possible, but it doesn’t seem to be. At the 500-1000m it’s 53% pure. Exactly like it was last year (53%) and even cleaner than 2010 (51%). When we move to the 1000-1500m, we see that 2010 and 2011 follow closely the same relationship at the 500-1000m. 58% and 60% respectively. But, some how, magically, this year, the 53% at the 500-1000m doesn’t equate to 60% at the 1000-1500m like it did last year. This year, it equates to 55%. Can someones work that one out? I mean if the impurities causing the lack of albedo make it exactly the same albedo as last year, but only at the 500-1000m level. As we get further up in the sky the ground somehow manages to turn to crap this year. If you observe a particular gradient at one distance, then I think we can pretty well resolve what we see at further distances. This doesn’t typically change….. unless we’ve some new things in light theory I haven’t seen. I don’t know…. still seems off to me. Maybe someone can explain what I’m missing. In addition to the problem of greenland being too far away for Asian soot there is the problem of why the albedo at those altitudes is impacted more than at other altitudes. It would be odd for the soot to only have that effect in a given altitude regime. See #2 & #5 regarding REAL air pollution and SE Asia. If it is all due to the MODIS sensor, then how can the ASCAT radar be showing this (from this blog post)? I think what James means is that you cannot have high albedo at 500 m, low albedo at 2000 m and high albedo again at 3000 m.
I mean if the impurities causing the lack of albedo make it exactly the same albedo as last year, but only at the 500-1000m level. Ice melt is cause by a combination of air temperature and solar insolation. Air temperatures decrease with altitude. Solar insolation (ignoring clouds) increases with altitude. 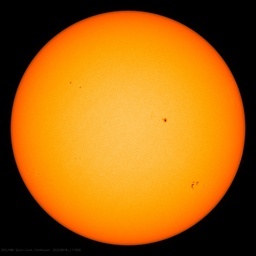 More melt from solar insolation and less from air temperatures would cause this effect. See my comment above about more southerly tracks of north Atlantic low pressure systems this year. Yes , the enviro movements simplistic and ill-formed obsession with CO2 is the main thing preventing them from protecting the environment. I suspect that changes cloud cover means that they are no longer getting rid of cloud effects in the data properly – probs due to the 11 day averaging not working any longer. and several of the currently active Russian volcanoes have been sporadically honking for a bit over a decade now. The issue of soot is not only well known for Greenland but also for the Arctic Ocean and the Himalayas. Many Warmists know this full well but quite a few climate scientists remain silent allowing the willfully ignorant to spread disinformation about temperature / global warming and ice melt alarm. Warmists can easily perform the soot experiment on any snowed in winters day with sunshine. Good point ! May explain the bands in deposited ice. I think there is consideralby more snow precipitiation at those altitudes. Air borne particulates would likely be deposited more at those altitudes. Someone should fly up in a helicopter and take some samples from these black ponds. Anaysis would show whether it’s volcanic of asiatic. Grímsvötn 2011? Fires in Russia? But Mosher’s words need heeding. Well it says ‘soot’ to you but it also says to me satellite sensor failure. It is not unknown for these to fail and the seeming sudden dropoff of the albedo signal shouts some sort of failure. Mind you there has been a lot of Russian volcanic activity lately so ash fallout could be to blame depending on the wind strength and direction. Please never say “Lol” again. China’s been bringing one coal-fired electrical plant per week on line since 2009 — that’s a lot of cumulative soot. That said, some of the crud in the photo of the moulin is probably bacterial mats. Thanks Phil…… I was confused about the distance noted on the graphs and took it to mean something entirely different. I reading your comment helped me find my error. The Chinese have a word for that. FU. Can someone provide the geochemical data to show what the dark material is exactly and where it comes from? More interesting than all this speculation. And please include some data from the black material in the ponds. 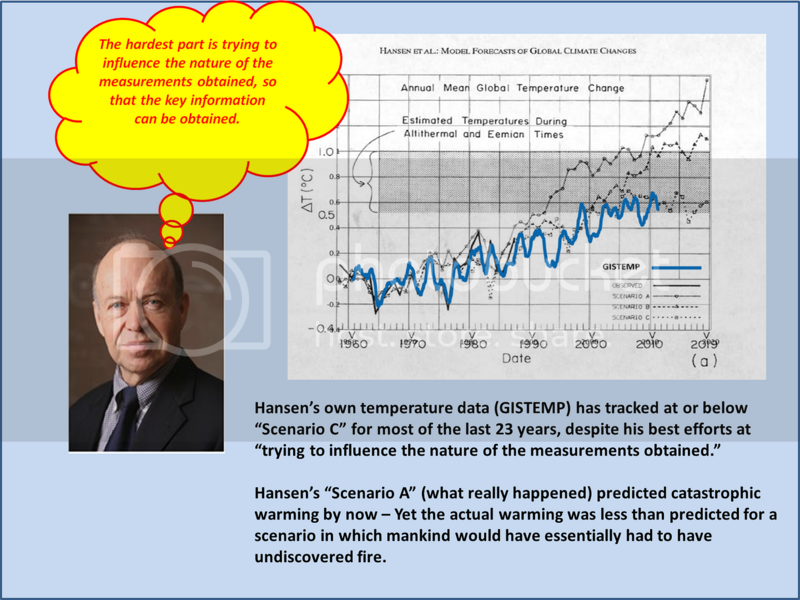 Let’s not forget Dr. James Hansen’s paper in 2003. Plausible estimates for the effect of soot on snow and ice albedos (1.5% in the Arctic and 3% in Northern Hemisphere land areas) yield a climate forcing of +0.3 W/m2 in the Northern Hemisphere. The “efficacy” of this forcing is ∼2, i.e., for a given forcing it is twice as effective as CO2 in altering global surface air temperature. BC in snow has higher efficacy (at least 3x CO2) than any other forcing agent reported to date. Some images of grey snow and ice. Hey, let’s not allow soot to get in the way of a wonderful fairy tale about the causes of Greenland Arctic ice melt. Even warm waters and wind play their part. C02 alleged ‘warming’ is a bit player. Could one explanation be new, clear snow at lower altitudes? That map shows only a small area of Greenland but it seems that it has been snowing there. The “normal” summer melt season albedo minimum at 2000-2500 m is in the range of 0.77-0.82. The “bottom of the chart” is 0.72. The albedo of fresh snow is in the range of 0.80-0.90, ocean ice 0.50-0.70, desert sand 0.40, bare soil around 0.17 and pure black carbon soot around 0.04. Either McKibben’s ignorance is breathtaking or he is an enviro-fascist partisan. Come to think of it, both statements are probably true. Here is my crazy theory. The changing cathode ray type focus of Birkeland currents guiding iron rich black cosmic dust onto the area of concern which has fertilised bacteria. Up to 300 tonnes of cosmic dust to be accounted for daily. Every 28 days Jupiter re-farts the stuff in “narrowly focused streams”. If it is soot, it may be up there due to the interesting jet stream we had last winter. 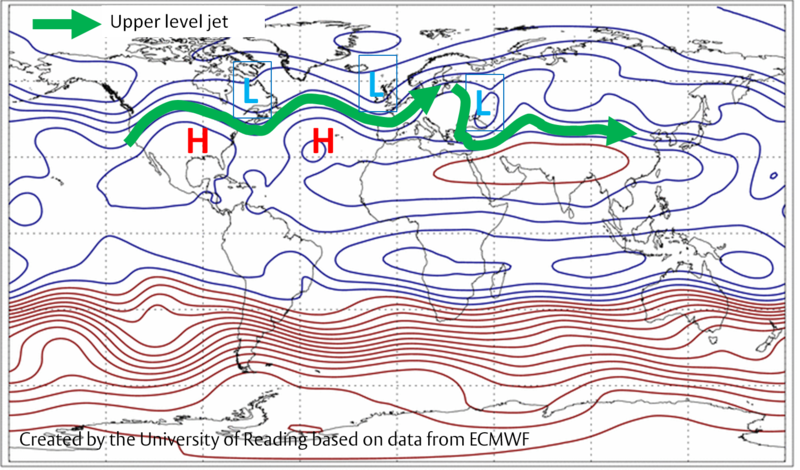 The jet was in a hybred pattern, zonal over North America, while a blocking pattern existed over Eurasia. The jet looped south over Europe, and when it looped north again it may have scooped up soot from India and China. Then, when the jet was “flat” across Canada, the soot would move directly west to east to Greenland. If soot was a factor, it might also explain the sea-ice melt on the north coast of Canada, which seemed surprisingly fast to me. The above ideas involve no math. I’m just looking out the window and puzzling. You can get Albedo charts and values from here. When I first read about this a few weeks ago, I did some checking. There is a big decline in central Greenland Albedos in the curent year, not so much previously. Bu nothing special has been happening on the Greenland icesheet summits. Temps are normal (and well-below Zero) but there has been more cloud perhaps. So either there are data problems or it is soot or cloud interference. I don’t pretend to know whether this phenomenon is real and important or not, but I have a question about this graph (and about many similar visual presentations). It is obvious that by limiting values on the Y-axis to a range of 72-92% rather than a full scale of 0-100% one makes the slope much more precipitous and thus the overall impression makes it seem that something drastic has happened. If they Y-axis were 0-100% it would look like a small dip rather than “off a cliff”…. (of course the real issues are with what it means scientifically, but I’m just asking about the presentation for psychological impact). Is this kind of truncation of values on an axis considered scientifically worthy, or is it merely a propaganda type of effect? One can make any change look much more (or less) dramatic by fiddling with the the values on the X-axis or Y-axis, and it seems this is done a lot in climate science. The picture and original argument make it sound like there are lakes in Greenland that have pure carbon black at the bottom. Carbon black is valuable (~$700-1000/ton). If this carbon black is actually there, why isn’t it being harvested commercially? and are they then supplied to low pressure, cyclone, systems where they precipitate out? The jet (this July) http://metofficenews.files.wordpress.com/2012/07/upper_level_wind_earlyjuly2012-v2.png seems to follow the line of fires through Asia and China and over the high pressure heat wave in America. If aerosols are ‘caught up’ in high speed jet stream winds their atmospheric lifetime would be extended, and they are likely to grow in size, sufficient to be incorporated into cloud droplets in cooler, humid areas like Greenland and UK. Just a thought! Sometimes here on the western seaboard of Ireland the rain storms bring ‘mucky rain’ with tiny lumps of black stuff in it. You can see on the velux (roof) window glass. There’s a problem in this story. Soot from fossil fuel combustion floats. Power boaters all know this as the engine exhaust is underwater and you can see the film of soot on the surface. The following talks about maritime exhaust filters to eliminate this because it can sometimes get bad enough, especially at anchor in calm water with a genset running overnight, it’s enough to stain clothing black you if you jump into the water in the morning. So the picture with the black-bottom pool of water – that ain’t soot. It’s volcanic ash. And the spike this year is because of the recent volcanic activity in the area which produced huge ash clouds. Well it says ‘soot’ to you but it also says to me satellite sensor failure. I’ve noticed the odd satellite sensor sometimes fails soon after a solar flare hits Earth! Yes, it is precisely because black carbon floats that it’s such a problem. If it sank then during any partial melt when the meltwater infiltrated the snow it would pull the soot out of site with it. But because black carbon floats a partial melt simply concentrates it on the snow surface. Anyone who grew up near a highway with 18-wheelers on it in cold winters knows when a few feet of snow melts close to the road the surface gets darn near black before it finally melts completely. And it melts far faster than pure white snow too. If McKibben was an engineer he would understand the strength of ice. Ice is strong under compression but virtually useless under tension. Ice shelves which protrude into a sea or ocean will eventually fracture and float away due to the rise and fall of tides. Is it possible there are to sensors for the two altitude readings? Looks like a failing sensor. On the other hand, soot would explain the rapid arctic melt this year despite average arctic temperatures. The graphs is normalised in Feb to precisely the same value, yet still ends up with 4% variation by november, when it must be totally snow covered again. This instrument obviously has relatively large errors compared to the data presented, so lets not panic or draw unwarranted conclusions about soot or meltwater just yet. the little dips that naturally occur in a noisy data set. I guess we are to believe there were no fires as part of the Russian heat wave last summer or any other summers if there is no news coverage of them! I suppose volcanic ash has stopped as any factor also as per the same selection bias on the assumption list. Maybe the albedo is changing because the Icecap is melting. Recent temperatures above freezing at the summit may have something to do with that. And there are washed out bridges and a missing tractor. (In best Captain Kirk voice) Difficult……. to…….. resist…….temptation……. Looks like about 12 hours of 1-3C temp’s scattered over a three-week period in which the daily high rarely topped -5C. I’m surprised that Dr. Masters didn’t quantify that and the missing tractor as another one-in-fifteen-gazillion odds against event. I don’t believe the change in albedo has anything to do with ‘soot’. Rock dust/volcanic ash/forest fire soot is always present in greater or lesser quantities. I believe, like CO2, soot from power stations plays a very small role. At 1800 on 11 July 12, Summit Camp in Greenland recorded a temperature of +0.5C and the maximum for the day was recorded as +1.0C. Obviously, a few hours (maximum of 6 since the other recorded temperatures that day were below freezing) above freezing will alter the surface characteristic of the snow and probably led to glazing the snow surface. This may have been widespread on the ice cap since Summit Camp is obviously at the highest point. Until snow or blowing snow covers the ‘glazed’ surface the albedo will remain as it is, lower than normal. It does NOT indicate ongoing melting since the temperature for the last week has been averaging around -11C. This post reveals the inadequacy of naive use of albedo – the ice/snow sometimes remembers things that have happened to it to confuse the unwary. It’s something of a misconception that China industrialization has increased black carbon emissions. we calculate that BC emissions in China in 1995 were 1342 Gg, about 83% being generated by the residential combustion of coal and biofuels. Rather, the reverse is true. As people move from traditional dwellings to modern housing in cities with electricity, BC emissions decrease. Do this not indicate that the natural system is functioning in a normal manner – the solids, be they from human activities or Volcanoes, are being washed off the land where rain falls and then buried in the bottom of lakes or deltas. In the case of Ice areas the dark melts the ice again taking the dark materials to the bottom where they will be buried in new ice and/or deposited on the ocean floor and buried in silt and other normal ocean heavy materials. Again we silly humans try to make a big deal out of a 100 year cycle – in geological time it is a nano second. I imagine Anthony is at least partially right, that albedo is affected by coal plants. I’m glad to know its not affected by anything man is doing (lol). What kind of animals are making the coal dust anyway? In addition to the coal dust, I would imagine that the overall warming of Greenland and the resulting “melting ponds” don’t help albedo either. Boy……if we can just keep the animals from making the coal dust AND the melt ponds, we’ll be good as gold. Problem is you would expect any error to be present at all altitudes. And you have to contend with and explain the actual ground truth calibration data. Anyone who wants to claim errors in the data must explain why the errors are confined to an altitude. Anyone who wants to explain this by soot, must explain why soot effects confine themselves to a specific altitude. there is one sensor. it measures returns from the surface. Altitude is already mapped for every 90 meters on the planet, and finer meshes than that are available, depending on the region. Read the papers, especially on albedo calculations. Well it is an event to watch out for and I do believe that the culprit is the soot ; the evidence points that way. But ice is not white. Crystals of water are white, Some crystals whiter than others. or folks can start with this paper. Abstract. Greenland ice sheet mass loss has accelerated in the past decade responding to combined glacier discharge and surface melt water runoff increases. During summer, absorbed solar energy, modulated at the surface primarily by albedo, is the dominant factor governing surface melt variability in the ablation area. Using satellite observations of albedo and melt extent with calibrated regional climate model output, we determine the spatial dependence and quantitative impact of the ice sheet albedo feedback in twelve summer periods beginning in 2000. We find that while the albedo feedback is negative over 70 % of the ice sheet, concentrated in the accumulation area above 1500 m, positive feedback prevailing over the ablation area accounts for more than half of the overall increase in melting. Over the ablation area, year 2010 and 2011 absorbed solar energy was more than twice as large as in years 2000–2004. Anomalous anticyclonic circulation, associated with a persistent summer North Atlantic Oscillation extreme since 2007 enabled three amplifying mechanisms to maximize the albedo feedback: (1) increased warm (south) air advection along the western ice sheet increased surface sensible heating that in turn enhanced snow grain metamorphic rates, further reducing albedo; (2) increased surface downward solar irradiance, leading to more surface heating and further albedo reduction; and (3) reduced snowfall rates sustained low albedo, maximizing surface solar heating, progressively lowering albedo over multiple years. The summer net radiation for the high elevation accumulation area approached positive values during this period. Concerns about the sensor? compared to ground truth fellas. Do they argue that its co2? Some interesting things. No suggestions that soot isolates itself to a particular altitude regime, but fire away.. testable hypothesis welcomed. That is one of the mechanisms they discuss. The others are related to weather patterns, the amount of fresh snow that falls, when and where, and snow crystal metamorphosis. Has anyone slung a bucket into one of these melt lakes to sample what stuff is at the bottom which looks black? Is it industrial soot, wildfire soot, local rock dust from glaciers or just an optical effect? the leprachuans theory is starting to sound as good as any. Working on the capture routine, I imagine they might need water-boarding ? While I do agree that the summer albedo drop is probably a function of summer melting, it’s still only about 12 years of data with one anomalous summer in that 12-yr time series. The GRACE measurements upon which the accelerating ice loss claims are based are heavily dependent on the GIA. 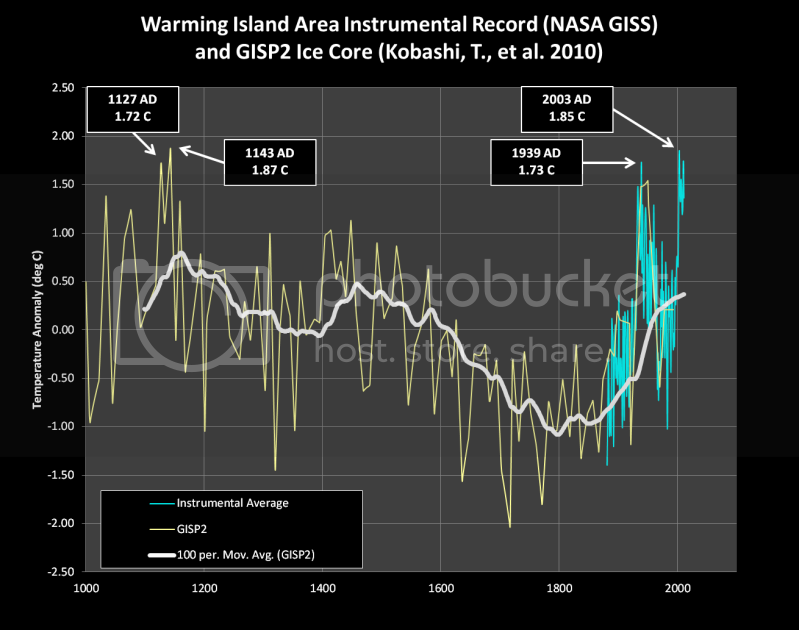 While not as large as Antarctica (where the GIA’s margin of error is nearly as large as the asserted ice loss), GIA variations can result in totally different ice loss values… And the GRACE time series isn’t any longer than the MODIS time series. There is an ongoing project to measure the effect of BC on Arctic ice albedo. Here is a presentation from the group. Many uncertainties. But some studies show large reductions in BC over the last 20 years or so. One study points to south Asia as a major source. we’ve had people point to the wrong albedo database: fail. GUESS WHAT. it doesnt matter one whit whether this has happened before. It most likely has. 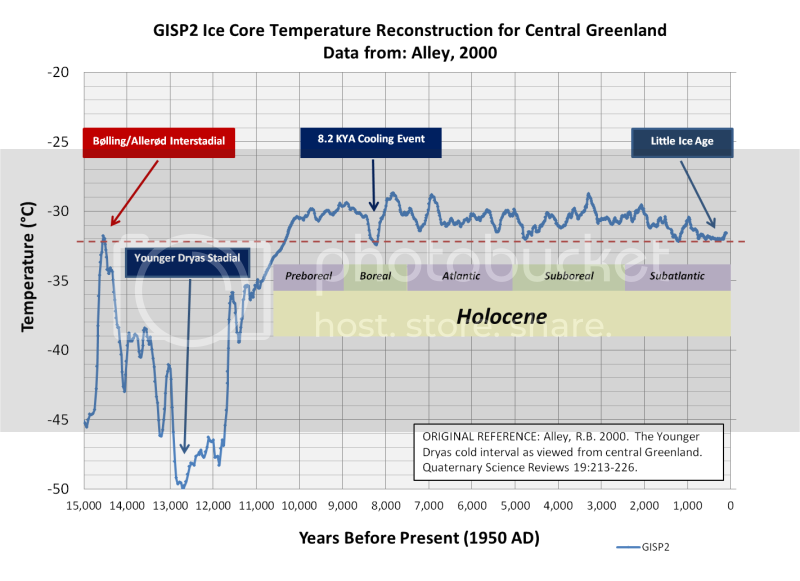 The MWP was probably warmer, the holocene was probably warmer. Neither of those matter. GHGs warm the planet. The question is how much. A warmer MWP means our problem is worse, not easier to handle. The assertion that the not unprecedented nature of the modern warming makes our problem “worse,” is simply baseless. You are correct that GHG’s contribute a net warming effect and that we do not know the net warming effect. But we have no real evidence that the modern warming is any warmer than previous millennial-scale Holocene warming periods. The only well-established difference between this warming period and the previous 10-12 is human industrialization. If we can’t tell the climatic difference between this warming and the previous ones, we can’t even honestly assert an anomaly, much less ascribe a cause. Furthermore, there are now dozens of peer-reviewed papers documenting that the previous Holocene warming periods were associated with much higher CO2 levels than indicated by Antarctic ice cores. Plant stomata reconstructions clearly establish that Holocene CO2 levels have routinely been above 300 ppmv, possibly as high as 360-390 ppmv. So, not only do we not know if there is a genuinely anomalous warming, we might only be responsible for less than half of the GHG rise. @ Steven Mosher , sorry I agree with Mr. Watts on this one; please tell me why you believe it is not soot from various sources. GUESS WHAT. it doesn’t matter one whit whether this has happened before. It most likely has. Steve Mosher makes very good points in his first paragraph – we really are not approaching this very scientifically. 1. The MWP was probably warmer, the holocene was probably warmer. 2. Neither of those matter. 3. GHGs warm the planet. 4. The question is how much. 5. A warmer MWP means our problem is worse, not easier to handle. I agree/understand points 1 to 4. My answer to your “how much?” is “not much”. The global warming from pre-1900 to ~1940 exhibits a similar slope to the global warming from ~1975 to ~2000 – this says “not much”. The global cooling from ~1940 to 1975 also says “not much”. The absence of global warming for ~10 to 15 years since ~2000 also says “not much”. OK – I’m assuming our global cooling prediction will happen, probably before 2020. The basis for my confidence is that all my other 2002 predictions in climate science and energy have already been proven correct. The imminent cooling one was fairly easy compared to some of the others. To quantify, a doubling of atmospheric CO2 from ~280ppm to 560, should this happen, will result in net global warming of less than 0.3C. Why then is the albedo only now ‘off the charts’. This is not right. I’m afraid Anthony is wrong on this issue. See my link above about 83% of BC emissions from China being from domestic and biofuel sources, and see figure 9 at the link below that shows global BC emissions from coal burning peaked as early as the 1920s and have certainly declined since the 1950s. Further, very little of China emissions will reach Greenland. IMO, the likely cause of the albedo changes is an increase in solar insolation causing BC and other particulate matter to accumulate on the surface. Although other effects may be at work, like changes in ice reflectivity from melt refreeze. The same effect is causing (at least in part) the disproportionate faster melt of older sea ice compared to newer sea ice. Or how about the simplest explantion – that the planet is warming due to greenhouse gas emissions, as predicted by climate scientists since at least as far back as the 1970s. The Greenland ice cap melt and the arctic sea ice melt (and receding glaciers in Iceland, etc) are more likely to be a response to higher ocean and air temperatures. Towns in the west of Greenland have generally been recording well above average temperatures during this summer and a new absolute record high was set in May. It appears the only simplicity here is your (lack of) understanding. > There’s a problem in this story. Soot from fossil fuel combustion floats. > can see the film of soot on the surface. You mean from back when climate scientists were predicting the coming “ice age”? You forgot to mention the “anthropogenic” part of the emissions. That greenhouse gases warm the planet is accepted, in the sense it’s not a “warming” but a retention of incoming solar energy leading to higher temperatures than without them. Of which water vapor is still the most important GHG. Because you said “warming” instead of “warmer” it is implied there is an increasing of temperatures due to increasing levels of GHG’s. But there has been a host of natural reasons for temperature variation identified besides GHG levels. To look at the recent geological eyeblink of increasing temperatures and directly ascribe all of that to GHG increases is… unscientific. Since humans have been repeatedly shown to be “along for the ride” on this planet rather than any sort of direct driver of changes to the global climate, with our influence limited to relatively small regional areas and the “proof” of human influence on global climate arising from the summing of those small changes into global products, it has yet to be shown humans can do virtually anything to alter current global trends. The albedo drop-off is due to the snow and ice becoming less shiny. Freshly fallen snow under clear skies reflects 84% (albedo= 0.84) of the sunlight falling on it (Konzelmann and Ohmura, 1995). This reflectiveness progressively reduces during the sunlit (warm) season as a consequence of ice grain growth, resulting in a self-amplifying albedo decrease, a positive feedback. Another amplifier; the complete melting of the winter snow accumulation on glaciers, sea ice, and the low elevations of ice sheets exposes darker underlying solid ice. The albedo of low-impurity snow-free glacier ice is in the range of 0.30 to 0.60 (Cuffey and Paterson, 2010). Where wind-blown-in and microbiological impurities accumulate near the glacier ice surface (Bøggild et al. 2010), the ice sheet albedo may be extremely low (0.20) (Cuffey and Paterson, 2010). Thus, summer albedo variability exceeds 0.50 over parts of the ice sheet where a snow layer ablates by mid-summer, exposing an impurity-rich ice surface (Wientjes and Oerlemans, 2010), resulting in absorbed sunlight being the largest source of energy for melting during summer and explaining most of the inter-annual variability in melt totals (van den Broeke et al. 2008, 2011). The observed albedo decline since the period of high quality satellite observations beginning in 2000 is largest in magnitude over the ablation area (-0.091±0.021 on average where an increasing dark bare ice area is exposed after winter seasonal snow cover ablates reveals a darker glacier ice surface with abundant impurities. The ablation area is where all previous cold season snow accumulation melts (or ablates) by the end of the warm season. The accumulation area is where there is net snow accumulation by the end of each year. A significant albedo decline of 0.046±0.006 in the 2000-2011 period from a year 2000 value of 0.830 is observed for the accumulation area, where warming surface temperatures is enhancing snow grain metamorphic rates. As far as Greenland is concerned, nah. At higher elevations, the snow is less shiny thus more energy is absorbed. At lower elevations, the ice is dirty thus more energy is absorbed. As the winds blow across Greenland, the extra energy at the lower elevations warms the air that subsequently makes the higher elevations less shiny. So unless you can figure out how to permanently cover Greenland with a layer of non-melting white shiny snow, as painting Greenland with a reflective coating would be ruled out on ecological grounds, there’s really nothing we can do about it. The feedback mechanisms are in place and operating, beyond human control, the Greenland ice sheet will inevitably go away. In about 1000 years by estimates I’ve seen, barring the end of the interglacial or cataclysmic events like extraterrestrial object impacts or massive volcanism leading to sudden global cooling, etc. That page (which has been altered significantly very recently) shows that at the non-melting altitudes ie above the ablation zone, the fall-off in albedo is the greatest. The opposite of what you said to Bill Illis (you owe him an apology). I believe hoar frost puts the sharp edges back again in ill-understood ways. 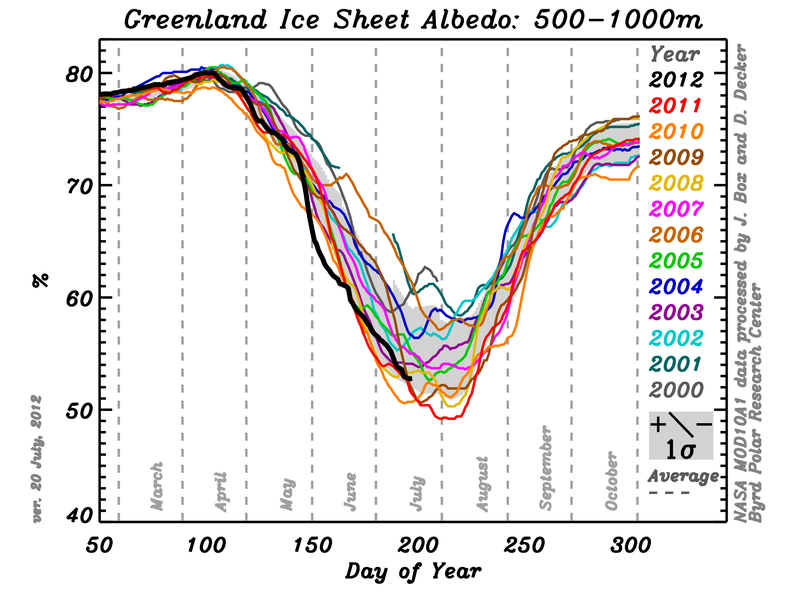 Why isn’t Jason Box highlighting the fact that in the ablation zone in Greenland (0-500m altitude) this year the albedo is rather high, only beaten, it would appear, in 2000 and 2006. If the melting is due to industrial black carbon depositing on the ice surface and concentrating in meltwater lakes, are we wise to allow the plans to exploit oil reserves in the Canadian and Alaskan Arctic? With no gas transport infrastructure it will have to be burned off. Would anyone care to estimate the effect of adding further black carbon deposition in the high Canadian Arctic and in Greenland? Well there’s albedo and then there’s albedo. At these quoted high altitudes; we are not talking about sea ice; but something that started as snow, which is a polycrystalline sparse matrix of small particles; a nearly perfect anechoic trap for electromagnetic radiation in the solar spectrum range. Initially after fresh snowfall, you can get these high reflectances from the sun’s input, but plenty goes into the material to get rapped by TIR and scattering processes, and this results in melting. No matter how cold the surface is, enough energy is absorbed to melt snow crystals , and once that happens, than a whole lot of solar energy transmits into the surface, and is TIR trapped. As a result those 80% plus reflectances are quickly gone in just a few hours after a fresh snowfall under the sun. So you don’t have to postulate any black gremlins to absorb solar energy, although I admit that happens. Even absent such materials, water itself that results from surface melting (doesn’t have to be vast pools of water, just micro surfaces). Snow that is three or four days old, is not such a good reflector. I’d still rather bet on tropical oceanic clouds for my albedo, than rely on getting good energy reflected from the frozen north. Look at the moulin photograph. Follow the left hand shoreline. About halfway up the picture is a band of black material a little below the surface. That is definately not a shadow or a deeper area. Natural gas flaring doesn’t yield black carbon. “You mean from back when climate scientists were predicting the coming “ice age”? Can I suggest you pay too much attention to media reports. Several serious science papers in the 1970s were noting that a substantial increase in CO2 concentrations could raise the global mean temperature by several degrees C. I was lucky enough to be taught at university (1979 – 1982) by an atmospheric physicist who was both a good teacher and who was working on these issues. He also went into a lot of detail about other human induced changes in the atmosphere that had consequences such as CFCs and HCFCs. It is notable that sceptics rarely seem to challenge that piece of science – yet the serious stratospheric ozone depletion was a direct consequence of the way humans can change the atmosphere – even in the case of those gases, at tiny concentrations. What gives the early CO2 papers weight in my view is that they pre-dated the main phase of modern warming – which started in the early 1980s. And please – you don’t need to repeat that there are “a host of natural reasons for temperature variation”. We know that. Many climate sceptics don’t seem able to get that the atmosphere is a very complex system with multiple forcing mechanisms, feedbacks, etc – which climate scientists are well aware of. So ocean currents, volcanoes, solar variations, cosmic rays, etc etc all can and do influence surface temperatures. The issue is by how much and over what timescales. So if the 0.5C rise in global mean temperature since the 1970s (NASA GISS) is not CO2 led, what is the forcing mechanism(s) ? Its easy to say its not CO2, but to say that also requires a science based alternative – not just wishful thinking. The point about rising CO2 levels (and other human induced changes in greenhouse gases) is that it is a new element in the equation and over a (geologically) very small timescale. 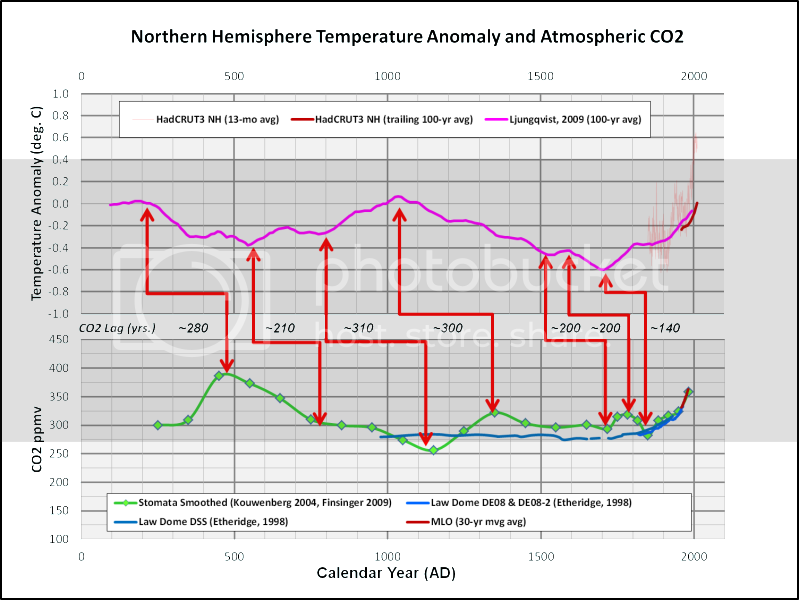 CO2 levels are much higher now than at any time in modern human history (last few hundred thousand years) and the change has taken place since the industrial revolution. It can also be calculated whether or not the amount of carbon we have burnt fits with observed increases in concentrations in the atmosphere allowing for feedbacks. It does (Houghton). So I don’t understand why sceptics flail around trying to find reasons to decouple the rising levels of CO2 from rising global tempertures. I have read some sceptic attacks that those who think the science is correct are acting “on faith” ie a religious stance. The reality is that science predicted what is happening and long before the media and the sceptic community got their teeth into this issue. There has been no serious undermining of the science. Thats not to say there will not be – good science is its own harshest critic. But right now, human induced global warming looks likely to the main cause of observed changes to temperature, sea level, glaciers, sea ice – and the Greenland ice cap. That turns out not to be the case. There is considerable literature on the subject. 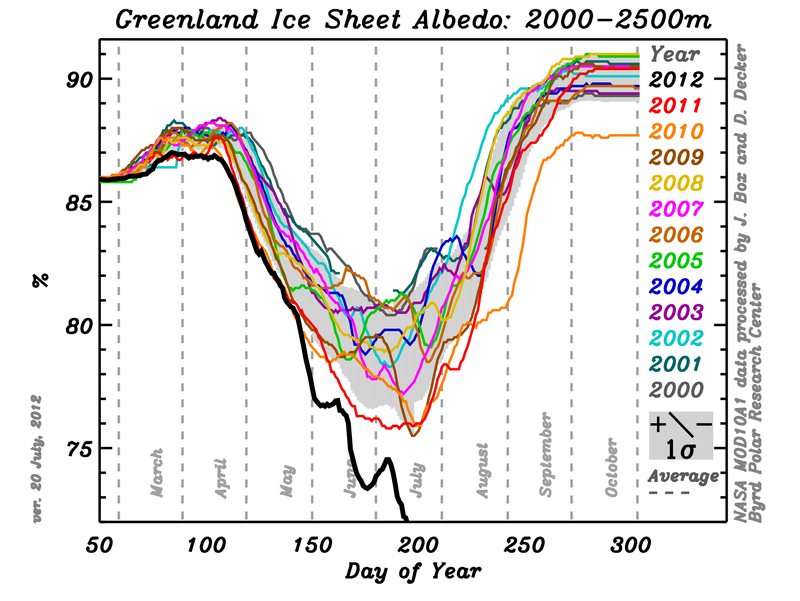 That we see icebergs with dark horizontal bands overlain with much lighter ice, as in the image I posted above, means periods in the past when albedo decreased were followed by substantial ice accumulation. Proving that continued melting is by no means inevitable. Entropic man points out the same phenomena in the moulin image above. All this speculation about what this black stuff is.. why doesn’t someone go up there, get some of it, (if it isn’t just an optical effect) and darn well find out !!! Chemical analysis.. you know…. science !!!!! mods.. add to bottom of previous comment if possible , please. I should have said that natural gas flaring is an insignificant source of black carbon… So insignificant as to be indistinguishable from zero. That’s less than 0.00002 kg PM per 1,000 cubic feet (MCF). A 10,000 barrel per day oil well with a gas:oil ratio of 1,500 would produce 15,000 MCF per day. If that gas had to be flared, the total soot output would be 0.3 kg per day. That is an insignificant soot yield. Total US gas flaring amounts to about 251,000,000 MCF/yr. That’s about 5,000 kg of soot per year. Total US PM10 and PM2.5 emissions amount to about 2,000,000 tons per year… 1,814,369,480 kg per year. That’s 1.8 billion. My bet is this is all another climate science false alarm – night fears – chicken albedo. The reality is, “serious science papers” in this case is a numbers game. The possibilities were increase, decrease, or no noticeable change. Undoubtedly there are papers for all positions. You can point to some papers that showed warming that coincided with a positive phase of the Pacific Decadal Oscillation, said phases portending global warming. Hooray for you. And by the standard you set, expect cooling in the years to come. At this point, frankly, you sound like a blithering idiot. The research is ongoing into discovering the different climate mechanisms, new work still being published. The effects of clouds, for example, are still contentious, as even admitted by the IPCC. Dr. Roy Spencer has a nice write-up about the issue: A Primer on Our Claim that Clouds Cause Temperature Change. Dr. Spencer had previously posited that a mere 1-2% reduction in cloud cover, related to the PDO, could account for that warming. Indeed, a sizable reduction was found over China, in opposition to expectations: Spencer’s posited 1-2% cloud cover variation found. So when you toss out about these elements of this incredibly complex and interconnected system that “…climate scientists are well aware of…” them, first you strain credulity that they are aware of all of them. And stating it like they are aware of how they all work and interact, sounds like ignorance as they clearly do not. Plus you toss in the argumentum ad ignorantiam, argument from ignorance, of ‘what else could it be but CO₂?’, implying the warming is anthropogenic, from the atmospheric CO₂ concentration increases. But the default is the warming is within natural variation. The onus is on proving this is not the case. 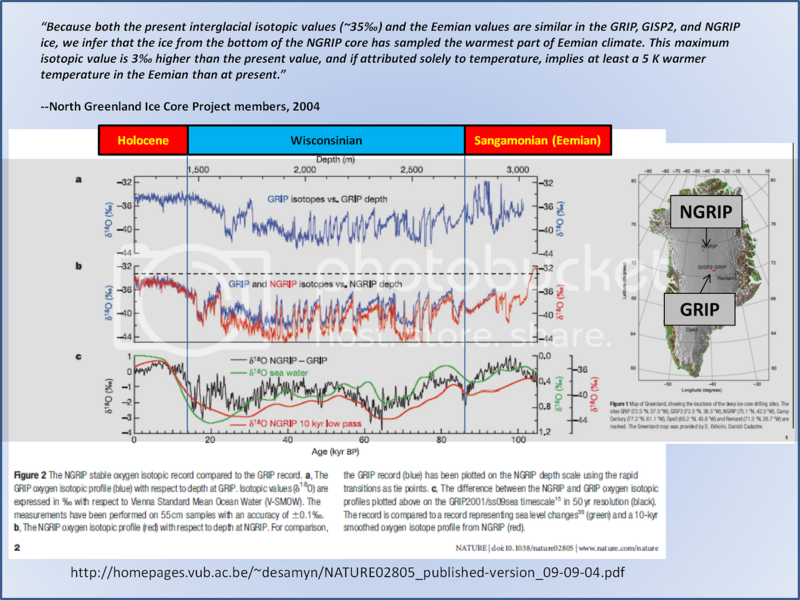 The warming has not been shown to be outside of natural variation. You demand a science-based alternative explanation for the warming. Good news, Dr. Spencer has provided one. Thus you certainly sound a lot less knowledgeable than you prefer to appear. That depends on the effect. Your figures add up to 109.5kg/year per flare. What we need now are figures for the rate of carbon accumulation per unit area for the Greenland ice cap and the effect of that accumulation on the albedo. Once we know these, we can say whether the amuont of carbon from flaring is insignificant or not. Average BC concentration in Greenland snow = ~1ng/g. Average annual Greenland BC deposition = ~300,000 ng/m2 (0.0003 g/m2, 0.0000003 kg/m2). Surface area of Greenland ice sheet = 1,710,000 km2 (1,710,000,000,000 m2). 0.0000003 kgBC/m2 * 1,710,000,000,000 m2 = 510,000 kgBC per year. My hypothetical well would increase the annual BC deposition by 0.02%. All of the annual gas flaring in the US would increase the BC deposition by 0.95%. Since there currently is no production from Greenland (onshore or offshore), no one knows yet what the production rates and gas yields will be. To put this into albedo perspective. If we use 0.90 for snow and 0.04 for BC, the current BC deposition reduces the albedo from 0.90 to 0.899999999140. If all of the gas flaring in the US was replicated in and around Greenland, the BC yield would further reduce the albedo to 0.899999999132. As I previously noted, natural gas flaring doesn’t yield black carbon. McConnell, et al. , 2007 will get you a modern deposition rate in range of 1-7 ng/g per year. McConnell, et al., 2001 will get you an estimate of annual snowfall rate. Thank you. It helps me understand it better. Regarding the sudden albedo change, it would seem to have been a transient high temperature weather event. @ Steven Mosher I believe this modern warming period to be almost all natural in origin and GHG never had any major effect on ^ increasing the warmth except for a blanket effect that remains a relative constant. 1,500 years ago we had a warming and 1,500 years before that another and they were completely natural in origin. So this is natural too and mankind has had little to do with it. Answer me Steven Mosher if you dare ! Regarding the high temperature event I too believe it to be an anomaly and not a signal of further climate change. I agree with Anthony in that it is soot and that to be a temporary event as there probably was a spike in coal/forrest fires earlier. You say increased CO2 in the atmosphere does not cause warming. Try this then – do you accept that CO2 is a greenhouse gas ? Hope so as that was proved when good old Queen Victoria was on the throne here in England. Accepting that basic bit of science, and knowing what the forcing effect is, then its possible to calculate how much the planet will warm for a given CO2 concentration increase. Or maybe you don’t accept that the increase in CO2 has been caused by humans ? I fully accept that not all scientists accept the CO2 link to global warming. Dr. Spencer is entitled to his views and you are entitled to believe in them. But its not a view shared by the majority of climate scientists. Most of us accept the fact that CO2 is referred to as a “greenhouse gas.” So-called greenhouse gasses are transparent to higher frequency incoming solar radiation and opaque to certain bandwidths of outgoing lower frequency radiation. Most of the bandwidths trapped by CO2 are also trapped by water vapor. Since greenhouse gasses only trap certain bandwidths, their heat-trapping effectiveness follows production functions (AKA diminishing return functions). Each incremental addition of GHG traps less heat than the previous increments. All other things being equal, an increase in atmospheric CO2 will warm the atmosphere; with the warming following a production function. However, “all other things” are never equal. If it was, Hansen et al, 1988 would have been able to accurately forecast the net warming from their very accurate forecast of CO2 concentration increase. And Kaufmann et al., 2011 wouldn’t be wondering where the missing 0. 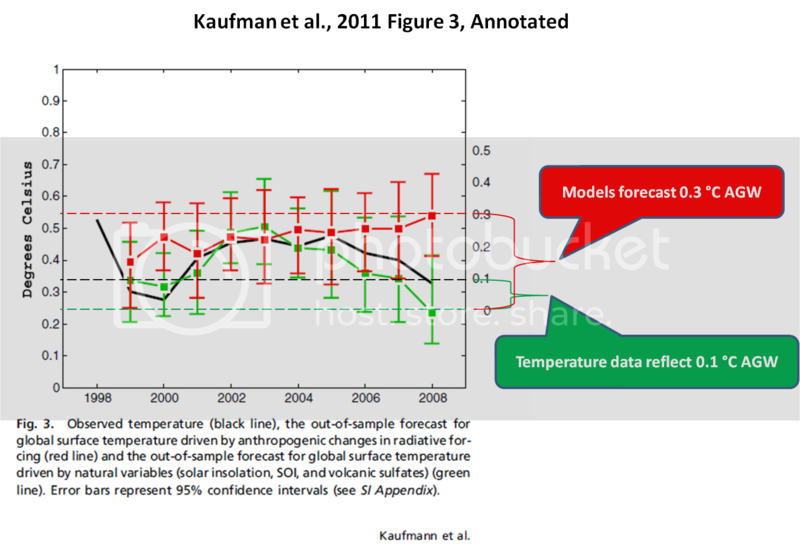 2°C of model-forecast warming went to. […]Or maybe you don’t accept that the increase in CO2 has been caused by humans ? Northern Sweden (Finsinger et al., 2009), Northern Spain (Garcia-Amorena, 2008), Southern Sweden (Jessen, 2005), Washington State USA (Kouwenberg, 2004), Netherlands (Wagner et al., 1999), Denmark (Wagner et al., 2002). The plant stomata pretty well prove that Holocene CO2 levels have frequently been in the 300-350 ppmv range and occasionally above 400 ppmv over the last 10,000 years. The incorrect estimation of a 3°C equilibrium climate sensitivity (ECS) to CO2 is almost entirely driven by the equally incorrect assumption that preindustrial Holocene CO2 levels were in the steady range of 270-280 ppmv, as indicated by the Antarctic ice cores. 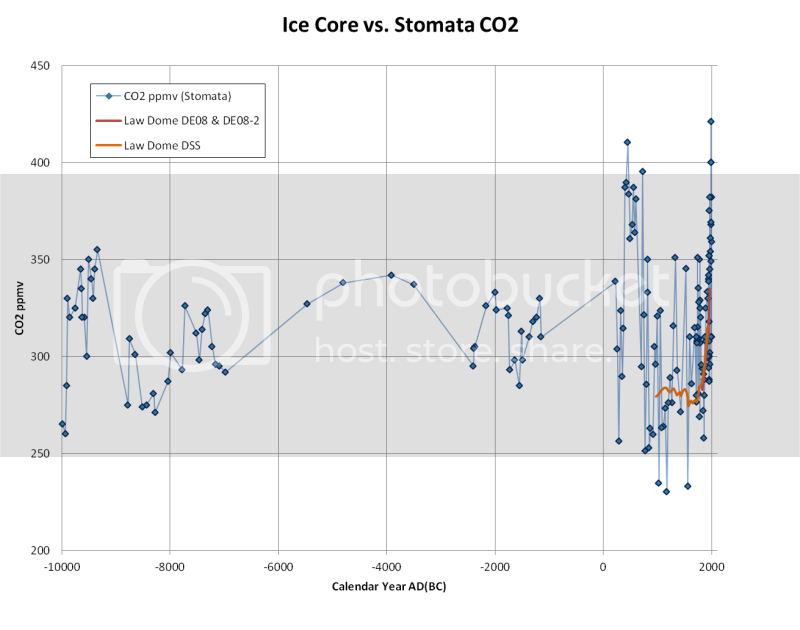 The plant stomata data clearly show that preindustrial atmospheric CO2 levels were much higher and far more variable than indicated by Antarctic ice cores. As the Earth’s climate continues to not cooperate with their models, the so-called consensus will eventually recognize and acknowledge their fundamental error. Hopefully we won’t have allowed decarbonization zealotry to bankrupt us beforehand. Where? I know it’s a favored tactic against skeptics to pigeonhole them into a blanket “Claims increased atmospheric CO₂ concentrations do not cause warming”, but the reality is more complex than that. And that’s where you run into problems. That requires a more complete understanding of the climate system than we currently possess. “Climate” is an incredibly complex interconnected system, with many feedbacks and the distinctions between “cause” and “effect” blurred. 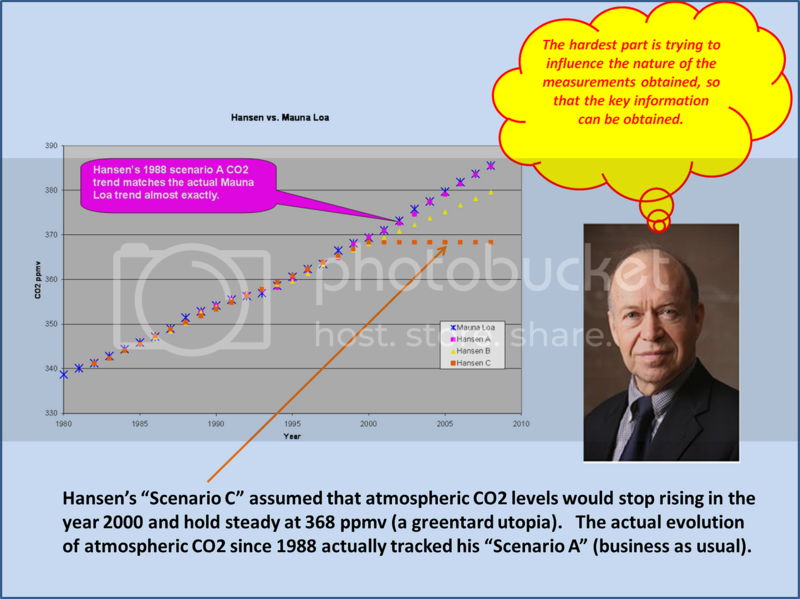 You cannot point to a single number, atmospheric CO₂ concentration, and state X increase will cause Y temperature increase. To do so shows ignorance. That’s a fallacious conclusion as it has not “been proved essentially correct”. The planet has warmed naturally since the depths of the Little Ice Age. The late 20th century warming went along with a positive phase of the Pacific Decadal Oscillation. There has also been peer-reviewed published work ascribing around half of the warming to black carbon (soot), even CFC’s can account for most of the warming. Add in the work of Henrik Svensmark and how cosmic rays affect cloud cover, which dovetails nicely with Dr. Spencer’s 1-2% cloud variation. And you find CO₂ is not needed to explain this geological eyeblink spate of increased global temperatures. Given the plethora of alternative explanations, it is not possible to ascribe with certainty even a portion of the warming to the atmospheric CO₂ concentration increases. Plus it is well known CO₂ has a logarithmic effect. There is increasing evidence the effect is saturated. Thus further increases will yield minimal increases in global temperatures, if any. There you go again. Blanket statements like that don’t sound very smart. How much of the increase has been caused by outgassing of CO₂ from naturally warming ocean water? How much from permafrost thaw which accompanied the natural warming, noting of course the conversion of the also-released methane from the decaying organic matter to carbon dioxide? Stick some usable numbers with just those two other sources of CO₂ increases, and you get closer to figuring out how much of the total increase is human caused. One thing’s for certain, it’s not all human caused. Did you miss the logarithmic effect? CO₂ can cause global warming, but its major effect is at lower concentrations. From here on upwards, it can’t do much if anything. And since when did ‘a majority of scientists’ mean all that much? The majority thought something else before accepting plate tectonics. Same thing before Darwin’s Theory of Evolution. Same thing before Einstein. True science is never “settled”, it awaits the coming of new theories that will better explain the evidence, while continually testing the old ones by looking for the quirk, the oddity, the exception, that shows an accepted theory is not totally correct. And bud, the way those 1970-80’s “CO2=OMG CAGW!” theories have been panning out, I don’t see how you can possibly be accepting them, whole and without debate, and pretend to be anything like scientific. The lower reaches of Greenland already experience high levels of summer melt, hence the difference in scales between the two graphs. Tying in the measurements of surface melt helps solidify the picture of high altitude melting this summer. Our eight-point Summary* includes a number of predictions that have all materialized in those countries in Western Europe that have adopted the full measure of global warming mania.